Everyone knows that fishermen are likely to exaggerate the size of their latest catch, but how many fish can brag of catching a man (aside from the one in Geico's cheesy 2015 commercial)? There is no exaggeration in the size of the fish that swallowed Jonah, and there is a lot of truth in this story to swallow as well. The message in this book lends itself to drama too, a great plus for your tactile/kinesthetic learners. Kids go to ticket booth and purchase a ticket to Tarshish. They get on the sheet which represents the boat. Students go to sleep in boat. Finally, the captain calls all the kids to get up. He holds out the straws and everyone draws one to see whose fault it is that they are in this storm. Whoever draws the shortest straw will become Jonah. 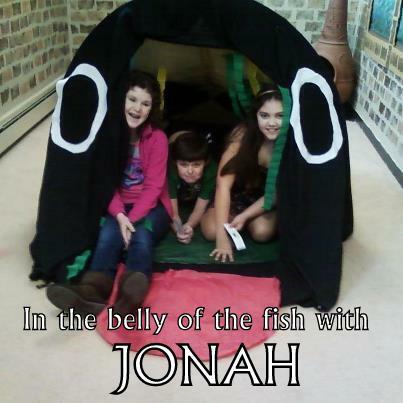 Jonah can deliver his lines right out of the Bible. The crew "throws" him overboard. The teacher proceeds to tell what happened to Jonah while he was in the fish, and then the fish can vomit the kids up on the shores leading to Nineveh. We ended the drama here, but of course Jonah preached God's message to Nineveh and had a 100% success rate. You can build a bean pole plant and let Jonah have his pity party because he wanted Nineveh destroyed - or you can just dwell on the teachings found in the first two chapters of Jonah. We played a review game entitled, "What Did the Big Fish Eat?" For each review question the kids answered correctly, they got to pull something out of the big fish's mouth. There where all sorts of funny things in the fish: a spider, pair of glasses, a cow, balloons, dead fish and of course, Jonah. Whoever pulled out Jonah won. You can find the complete directions and patterns for this game on Danielle's Place of Crafts and Activities page entitled Free Jonah Sample Sunday School Lesson for Children.